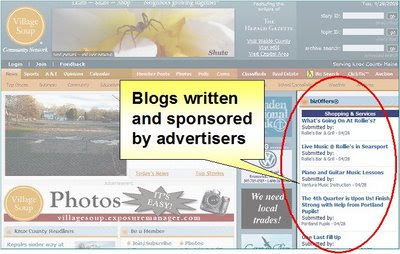 Richard M. Anderson, a publisher serving four Maine communities, has found a way to generate as much as a fifth of his ad revenue through hyperlocal websites featuring, among other things, blogs that are sponsored and maintained by local merchants. He tells how he does it in this guest commentary. Is the newspaper business sustainable? Not any more. Is the community network business sustainable? Yes. And at the hyperlocal level. Some people think we’re crazy. We’ve spent the past 12 years developing a community network business. In this model, we take one step backward and two steps forward. We've stepped back and re-focused on hyperlocal population centers of 20,000 to 50,000 people in four communities in Maine. Why? Because it is in these places, whether urban neighborhoods, suburban villages or ex-urban towns, that citizens are most closely engaged in the practice of democracy at its root level. This re-focus is possible because the Internet has reversed the flow of information. In the old days, major daily newspapers brought world, national and state news to hyperlocal population centers. Now, reporters, citizens and businesses in these centers share their news and information across the globe directly. No daily paper to monitor and filter the flow. Our community network model consists of two products – branded web sites we call VillageSoup and separately branded weekly newspapers. We have four newspapers in Rockland, Belfast, Bar Harbor and Augusta. And each one has its own VillageSoup website. Our community network model began in1997 as an online publication. In 2003, we introduced two weekly papers-of-record to compete with four legacy weeklies. In 2008, we acquired the weeklies, which each were 100 years old. Our products enhance each other. Professional journalists report news as it happens on the website. Weekly, this news is contextualized, analyzed and printed in the newspaper. Citizens and businesses post timely news and information online and many of their posts also appear in the paper. And two-thirds of our web sites’ front pages are filled with citizen and business posts. We call them, “Neighbors growing together.” Our community networks are the trusted source of news and views. The most distinctive component of our model are the sponsored postings (illustrated below) that businesses can buy. The posts, which run right next to the ordinary editorial content, are not controlled by us. No fetters, no filters. In the two most mature of the four markets we serve, the sponsored blogs help generate a large portion of the online sales that collectively generate 19% of our $2.5 million in annual advertising revenues. So far as I know, no other newspaper, not even The New York Times has been able to do this. The Knight Foundation recognized the value in our business model and in 2007 awarded VillageSoup an $885,000 News Challenge Grant. We are using these funds to redeploy our platform as open-source code for downloading and operating at sites independent from VillageSoup. We also offer entrepreneurs and legacy newspaper companies the opportunity to join VillageSoup Common using our own variation of the open source code in conjunction with a suite of services from VillageSoup. Here is how this model works. VillageSoup handles the technical stuff and provides the brand and its promotion. A VillageSoup Common wiki provides a repository of experiences and ideas which empowers small operators to learn and advance in ways not achievable as stand-alone entities. So, one step back, re-focusing on hyperlocal communities of 20,000 to 50,000 people, and two steps forward – creating hyperlocal community networks sourcing the community, bundling professional, amateur and business content – and generating new revenue from businesses using our platform to inform and serve their customers in the neighborhood and beyond. While there is much to learn, we are convinced that this evolving community network model will soon be applied to hyperlocal communities around the world. The most interesting thing is the combination web-paper and the right answer to the question: in which business are you? Well how are they generating the rest of the income? I don't see any special sauce. It's not a particularly attractive site, so it looks like all they really have is those legacy newspapers that they bought their readers with. What I am trying to do is challenge all our local sites by getting the local news out sooner than everyone else and then putting each breaking story on twitter and facebook and a dozen other social blogs. The key here, what my readers are telling me is that want local news AS SOON AS IT HAPPENS and with pictures. I am also leveraging technology so that the site almost runs itself. Currently it looks like some people think that hyper local means that you let people put comments about your story. I am adding new features every week that allow people to become more interactive each day, and we are emerging new features that will enable a _real_ hyper local media approach that is more than the news - it will be the center of the universe for all things Santa Barbara. "Gathering and immediately sharing news where there was otherwise only weekly news was our third focal point. Whether the news is a local tragedy or achievement, election returns or just the opportunity to share images of a beautiful view, our professional journalists make information and news available to others when it happens. No more waiting until next week’s paper. To launch our news efforts, we hired as our first reporter a former bureau chief who worked for one of the state’s dailies. From there, we built a team of reporters and editors; now, we have 13. Having begun as Web-only, stories are entered into the database ready and available for online publication. A copy manager schedules when a story is to go live online and assigns a story a page of the paper, if it is to appear in the paper. (Aside from our online news, we now publish two weekly paid subscription newspapers for residents in the communities associated with the Web site.) Our Web-based publishing system codes stories with XML tags for exporting to a page make-up system. These tags identify a story as breaking news, feature, or current news as well as labeling it according to traditional news sections and location. The system automatically codes stories including placing images uploaded by the reporter. Reporters take their own photos and are now beginning to shoot video and occasionally record audio. A regional network television reporter and cameraman work out of our office, and his daily feeds to two stations appear on our site as well. We actively solicit bloggers from these communities while we also allow those who express an interest in blogging to log on and become bloggers. Member stories and comments appear without solicitation or active encouragement on the part of the Soup staff. Content is exclusively local. This combination of professional, amateur and business content is proving to be successful, and VillageSoup has become an integral part of daily life in these Maine Coast communities." "VillageSoup handles the technical stuff. While a version of the platform code is available free, the installation, maintenance and improvement of the code is not. Software engineers and connectivity costs can be shared among all members of the Common. VillageSoup also allows provides the brand and its promotion." VillageSoup accepted $885,000 of Knight Foundation money with what should have been the understanding that it develop a real open source publishing platform and not redefine the term "open source" for the specific benefit of VillageSoup. According to Knight's description of the grant, "Through this grant, VillageSoup will rewrite its online publishing and user contributing platform from its original proprietary software to a new open-source publishing system. The grantee will blog about the project. This all-in-one solution hopes to encourage greater citizen news experimentation by reducing upfront costs for new sites and by helping them reach profitability quicker." The money Knight spent could have gone to other projects for the development of real open source which could have provided greater benefit to the online news community. One also has to wonder how willing Knight will be to fund future open-source projects when a publisher considers the term to mean anything that's convenient. The journalism community is supposed to be held to a higher ethical standard. There are a lot of people who have worked very hard over the years to become a trusted voice in their communities. By redefining the term "open source," it seems to me that VillageSoup has crossed over an ethical boundary into sharp business practices. All of which just adds more ammunition to a strident faction in the blogosphere now gleefully looking forward to the death of newspapers and the craft of journalism. Many of whom may be posting on something such as open-source WordPress around which an entire software ecosystem has evolved. Define irony. This is good, but it's not obvious why to some in the editors in newspaper biz. A way to serve the businesses in the area who will pay for these services is what is the news here. No, it is not the silver bullet. But, it is some new revenue. Oh, and yeah, some journalism of a type is happening, too, BTW. But, ignore that. It is the biz model that needs to be looked at here. Many newspapers are close to this already. Progress is being made. Funny how Anderson is held out as some kind of guru when in fact his company has never lost money faster. There have been repeated layoffs, all employees took a 10-percent paycut earlier this year, he's closed formerly booming papers that died since he purchased them and the circulation of his remaining print products is tanking. In fact, the only papers gaining circulation both online and in print, in Maine (including the Free Press in Rockland and the Mount Desert Islander in Bar Harbor) are his direct competitors. Anderson provides an answer to that old Down East quandry "How to you make a small fortune in Maine?" You start with a large one. I think the code is open source. he is referring to a service that they offer that uses a "version" of the code. Hopefully no portion of that "version" that isn't available in the public code was written with the Knight money. That would be unethical. Whcih brings us to the Knight money. $800,000. Oh my, that is some expensive blogging software. We appreciate any publishing model out there just trying to innovate within the medium of the web and create new value between readers and consumers. 22Local.com, Jackson Hole, Wyoming. I think some above comments are missing the point; the granted money was an award for the company to spend any way they chose, not specifically granted toward open-source conversion. They chose to spend it on rewriting their code so that others could use it. I think this is an interesting idea, and it seems to be working wonderfully for VillageSoup. It's just one of many ways that we can bring news into the 21st century while keeping print going. I have spent countless hours trying to figure out how to balance the two. Kudos to the VillageSoup team! I'm curious as to how you might present this idea to a board of newspaper owners, editors, and publishers who run a fairly large newspaper that has been around for over a hundred years but tend to stray away from the internet side of publication. Keep in mind that this board is fairly older and more old-fashioned in comparison to the current rush of web designers/developers, bloggers, and younger journalists. What seems to be forgotten in the debate about open source news is the value of journalists to the community at large. If Anderson and VillageSoup can raise readers' awareness as to the hours of research that go into presenting a news story, perhaps people will begin to recognize the need to provide material support to those who produce the media they rely upon. Those who advocate for an end to private ownership of the written word need to consider the effort, time, and even electricity and cell phone charges, that go into producing the news and other written matter that they use and enjoy. Blogs and news-du-jour sites only go as far as the particular interest of their producers. Professional reporters tell stories whether or not they have a personal interest in the subject, expanding their knowledge base as well as that of their readership and digging deep into the connections that story may have with other issues of concern to their communities. Even after the pay cut Anonymous mentioned, Anderson's staff is still working. I'm sure they'd appreciated any ideas as to how revenues can be increased to get them back to their previous salaries. Open source banks? Open source grocery stores? First, I'll try to clarify our use of the Knight funds. In accordance with the terms of our Knight Foundation News Challenge Grant, we are using the funds to create an open source version of VillageSoup's software, which combines blogs, citizen journalism, online advertising and reverse publishing from online to print. The Knight Foundation will sublicense the open source publishing system software to third parties under the GPL and Creative Commons License. Second, I'll respond to your question about presenting this idea to newspaper company boards. Existing boards have three difficult decisions to make and history does not bode well for them doing so. Newspaper Next 2.0 (http://www.newspapernext.org/Making_the_Leap.pdf) documents the reasons for this. These boards have to decide to be the one who takes revenue from themselves; they have to decide to relinquish control and accept businesses as partners in creating the user experience; and they have to decide to be in a new business, one which offers small opportunities to many rather than large opportunities to few. The compelling reason to do so? If they don't, someone else will. Barriers to entry are lowering but are not-yet so low as to make it easy for new entrants. They have time to act. And gaining experience with the evolving community network model will be advantageous, optimizing the enviable position their brand provides. "This would have been interesting back in 2002." It seems that VillageSoup is behind the times. Everybody is already hyperlocal. Monetizing it is a different story, however. Can't see the relevance unless the target is 50-somethings that are just getting into blogs and are feeling high-tech now that their kids taught them how to use Facebook. Mr. Anderson took a great company (Courier Publications), gutted it, laid off long-time employees, and alienated subscribers and readers.